I can’t believe that the last time I put together a beauty routine post was in 2013! It’s been nearly 3 years and my routine’s changed almost entirely since then. 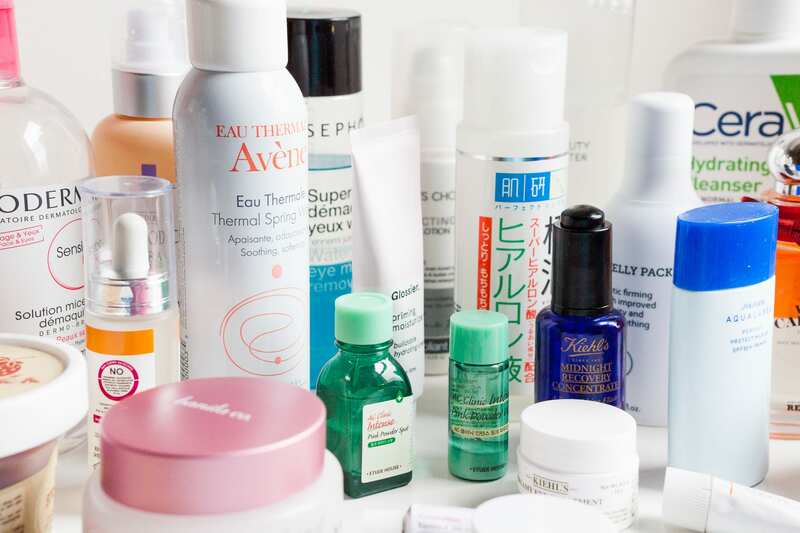 I’m going to be switching out some of my heavier products since spring is around the corner (FINGERS CROSSED) so I before I pack things away, I thought thought I’d share a monster-sized post about all the products I’ve been using this winter to keep my skin in check. Hopefully in a few months time, I’ll get around to a spring/summer routine post as well. One of my goals this year has been to finish up using products & to give away things that I’m not going to use and one of the ways I’ve been doing this is to use a separate day and night item for steps that you probably don’t need 2 products for (ie. toner, eye cream, facial oil, etc.) Please don’t be alarmed by how many products there are and keep in mind that it’s not necessary to use all of these things. Also! I really wanted to talk about every item in detail, but ended up trying to cut it down. This is still a whopping 4000 word post so kudos to anyone who reads it all the way through. ★★★★★ Products that I love, highly recommend, and which I would or already have repurchased. ★★★★☆ Products that I like a lot and would consider recommending, and which I am considering repurchasing. ★★★☆☆ Products that I am neutral on and which I may mention in conversation just as an option. ★★☆☆☆ Products that I disliked and would strongly urge someone not purchase. ★☆☆☆☆ Products that I hated and thought were an absolute waste of money. 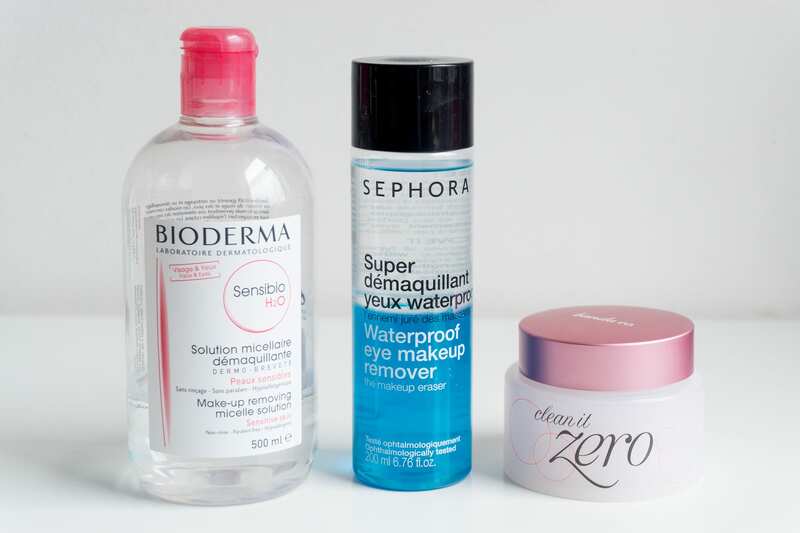 I wear waterproof mascara almost exclusively so I’m always on the lookout for a good bi-layer eye makeup remover. I don’t know that I’ve found The One yet, but the Sephora one in my opinion is always a good one to fall back on. I’ve got this because I had some store credit, but I think the Neutrogena bi-layer is comparable and cheaper! 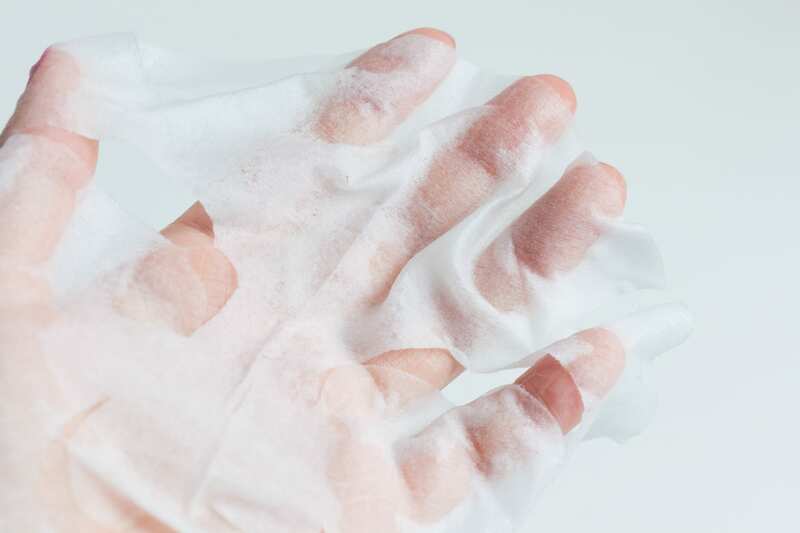 I’ve heard good things about Clarins’ and Lancomes’ removers, but until I get cashmoneyrich I can live with a cheaper product, patience, and lots and lots of cotton wipes. Omg! I love the Banila Co. balm and I can’t stop recommending it to anyone looking for a new oil-type cleanser for removing their makeup. The cool thing about Clean It Zero is that it’s actually a sherbet formula which you have to scoop out of the container. 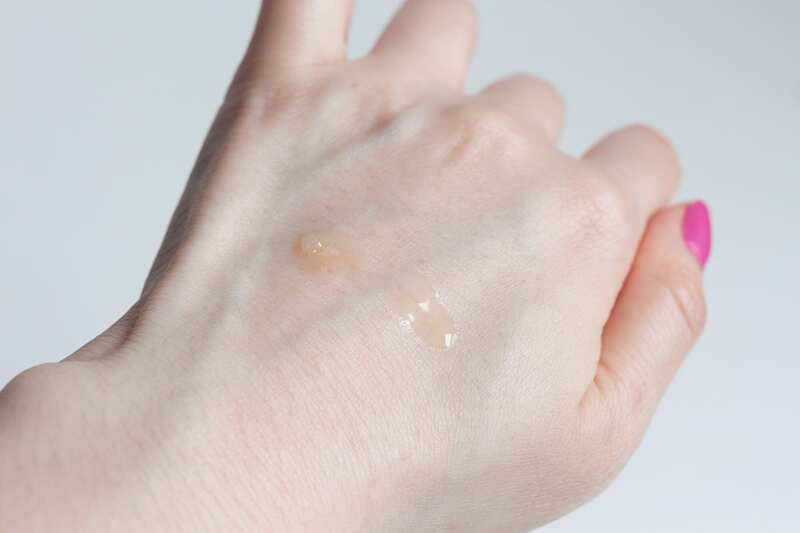 The warmth from your hands will turn it into an oil that you apply to dry skin, which will emulsify and rinse away with warm water. It doesn’t leave any sort of stickiness or film after rinsing. 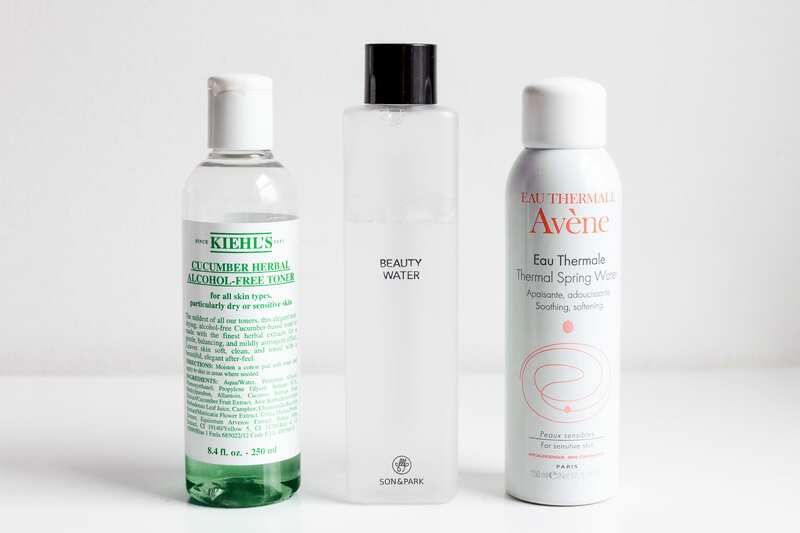 It removes most if not all of my makeup with the exception of waterproof eye products, but I always use a separate eye makeup remover anyway (you should too!!). It has a light floral scent which I find really pleasant, but my friend pointed out that it has papaya extract in it so see if you’re sensitive to the scent of papayas you might want to see if you can get a sample to try before committing to the full-size. For those of you who live in Flushing, The Yeon carries it in store and they have a tester for use. A dermatologist recommended this cleanser to my mom after a few laser treatments and she asked me to try it out as well. I liked it so much that it’s my basically my every day cleanser. 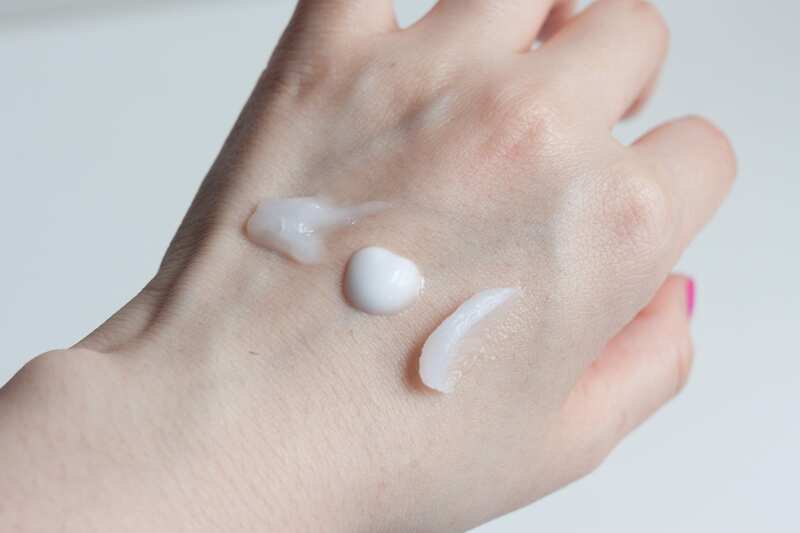 It’s a gel-based cleanser without lathering agents and contains ceramides and hyaluronic acid. I stay far away from foaming cleansers because they dry my skin out so it was nice to find a gel cleanser that was effective and didn’t just dissolve into water upon contact. It’s fragrance free as well! Like it, love it, already own it in bulk from the wholesale club. I really liked the moisturizer from the Skin & Good Cera range so I thought I’d try another product from the line, but it was a big mistake. This is probably meant for someone with even drier skin than my own because cleanser clings to the skin and then refuses to rinse away properly. A cleanser that can’t be cleansed – how ironic.. However, I did notice that if I managed to ignore the post-rinse film and proceeded with drying my face, I would be left with a VERY soft face after washing. It enough to make me continue using it for the duration of the cold season, but I don’t know that I could recommend this to anyone nor would I purchase it again. I bought this toner just a day after I told my friend “I don’t know if I really need a toner.” The sale staff at the Kiehl’s counter caught me and sunk their fancy claws in me and I went home with a bottle of this wonderfully medicinal and herbal green toner. What I liked about this is that it’s alcohol-free when most toners on the market are alcohol-based and alcohol in skincare is a nightmare for dry skin. It gets points in that category! To be honest, my overall impression with this toner was “meh.” I’m not sure it made my skin any better, but it hasn’t had any detrimental effects on it either. I did love the smell and really relished in putting it on, but at the end of the day I was still asking myself I needed a toner. I think the Son & Park Beauty Water was so expensive that I am convincing myself that it’s doing something amazing for my skin. I don’t need a separate night time toner and I promise that I’m not posh enough to have actually bought this to be used exclusively in my night routine. Son & Park is the namesake brand of Korean makeup artists Son Dae-Sik and Park Tae-Yun, who have worked on artists like Jeon Jihyun and if I can get even a foot closer to having beautiful skin then I WANT IT. The Beauty Water is a purposefully vague name because it supposedly tones, exfoliates, and hydrates. I would lump it into the same category as Bioderma except that the Beauty Water is very heavily fragranced and I don’t feel nearly as “cleansed” using it (and definitely would not use it near my eyes). 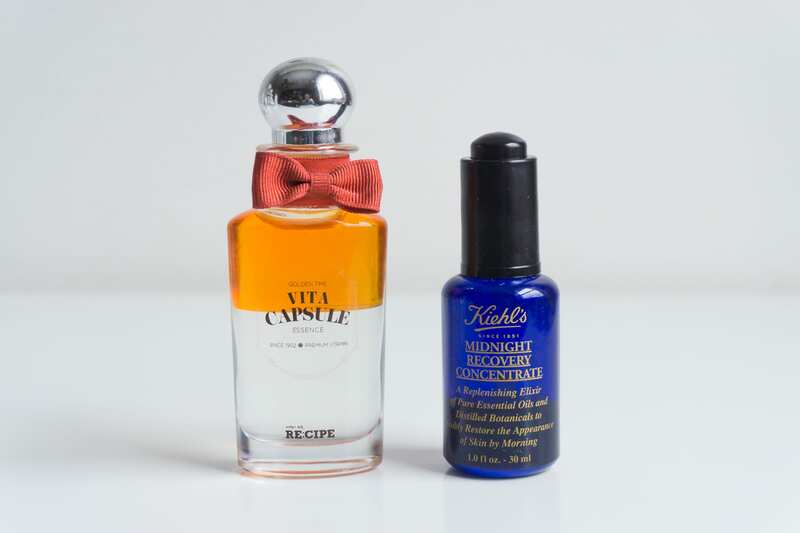 I use this at night on days that I’ve worn makeup as a final FINAL cleansing step and …. I may be deluding myself, but …. my skin looks nicer the next day …. 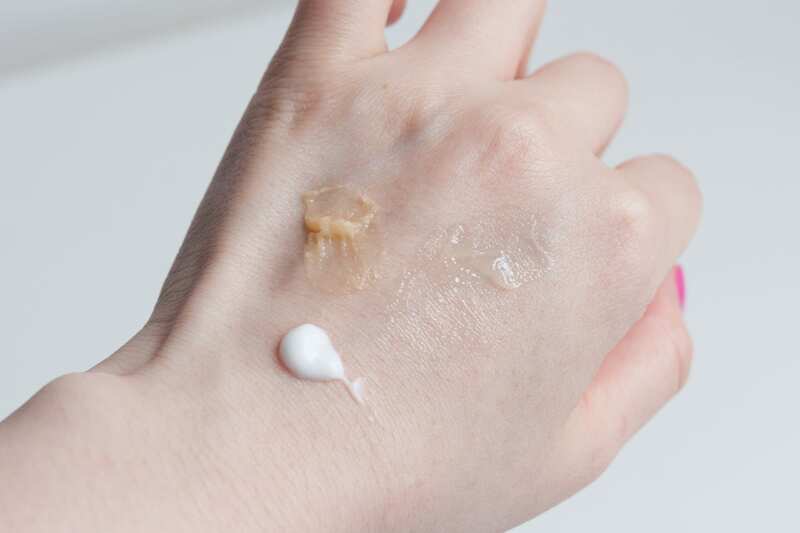 There was a period in which I stopped using it in lieu of re-testing the Etude House Wonder Pore and I swear that my skin didn’t look as great. It wasn’t even a difference that I could put my finger on, but my skin just looked smoother. Hm…. I know it’s water in a can, but it’s water in a can that makes me feel like a Luxurious Lady™.  I recently finished my entire stock of the Evian spray (at one point I had the 10oz bottle & at least 6 of the travel sized) and opened up the Avene to try it out. I’m on a mission to compare the big three (Evian, Avène, La Roche Posay), but for starters, the Evian had denser droplets so the “cooling” effect was more apparent, but the Avene spray has a much denser mist and distributes more evenly. The Avène is much more readily available for me so I would definitely consider getting it again. I’m going to buy this “lotion” until the day they stop making it! ✨ It saved my skin in my late teens and I swear by it for anyone with dry skin. 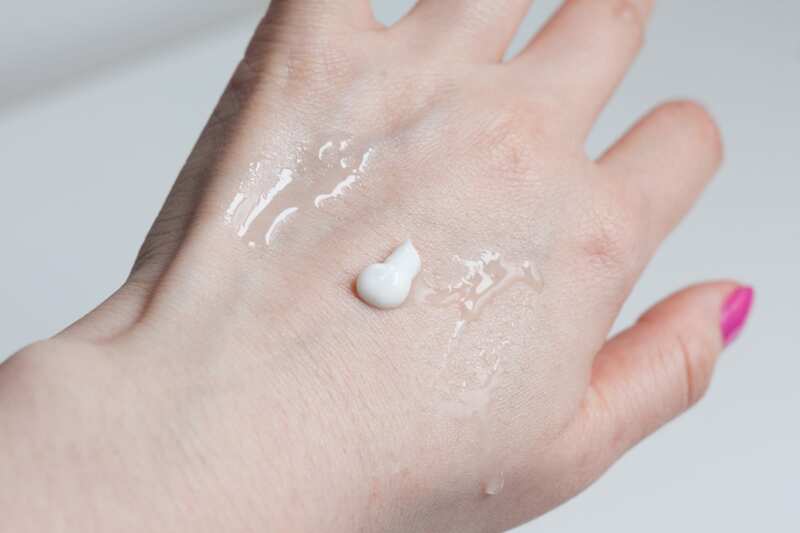 It has the consistency of an essence (slightly thickened water texture) more so than lotion and it dries to a tacky finish which can be off putting for some people, but seriously give it a try. Since it’s a humectant, I’ve taken to spraying a mist on right after and that sequence of steps has made my skin so much softer. 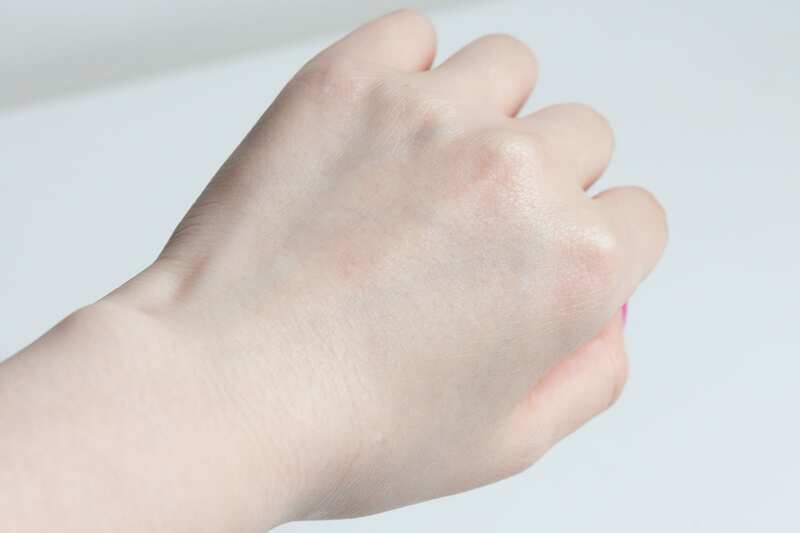 It’s one of Japan’s best-selling items and you have to try this if you’re struggling with dry skin! I hopped onto chemical exfoliants just like everyone else and ended up with the this BHA lotion from a friend’s recommendation. 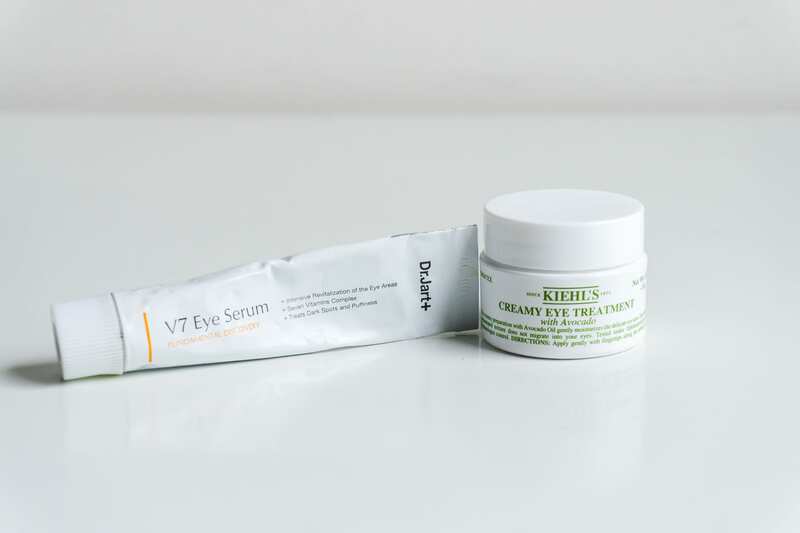 I loved the sample so much I got a a full-sized product, but it doesn’t seem to be working as well for me anymore. When I tried it, the lotion made my blackheads appear less dark the following day, but these days my blackheads just… look… the same. I am however, doing a crap job about using it daily – when I do a mask, I often just go to sleep post mask and skip the rest of my routine so to be fair, I should probably try to use it more regularly before I make up my mind. This AHA concentrate is one of the strangest things I’ve smelled – it’s like an orange peel after it’s been soaked overnight in alcohol. Not exactly unpleasant, but it catches you off guard when you forget. Again, this is one of those products that I need to be better at using regularly because I remember it doing some great things for my Glow at the start, but with less regular use has become kind of a whatever step. I have read that you can use AHAs near the eye area and I’m considering tapping a bit underneath where I have fine lines! I bought this from Sephora during the AHA/BHA kick, but it looks like it’s been discontinued. IT’S SO PRETTY. This came in one of my global Memeboxes, but I only just recently unboxed it to add to my morning routine. I’ve been struggling with my makeup drying out so I wanted to add an additional product to hydrate before I topped off with foundation. The bi-layer feature gives the essence the slip of an oil so I use it as such. It has a light citrus scent & absorbs into the skin in 2-3 mins so I like adding it under my morning moisturizer so give my makeup something else to sit on top of. Unfortunately, I can’t find a single seller online so I guess I’ll just have to make do with this bottle. I love this and I already have a backup ready for when I finish the current bottle. When did I become this person that uses so many Kiehl’s things?! The botanical oils in this gives it a herbal smell which is right down my alley!!  It’s a heavy oil so I like patting it in rather than spreading it, but it feels soooo rich and nice on my face. My skin looks smooth and bright the next morning and I notice a big difference when I’m not using it. 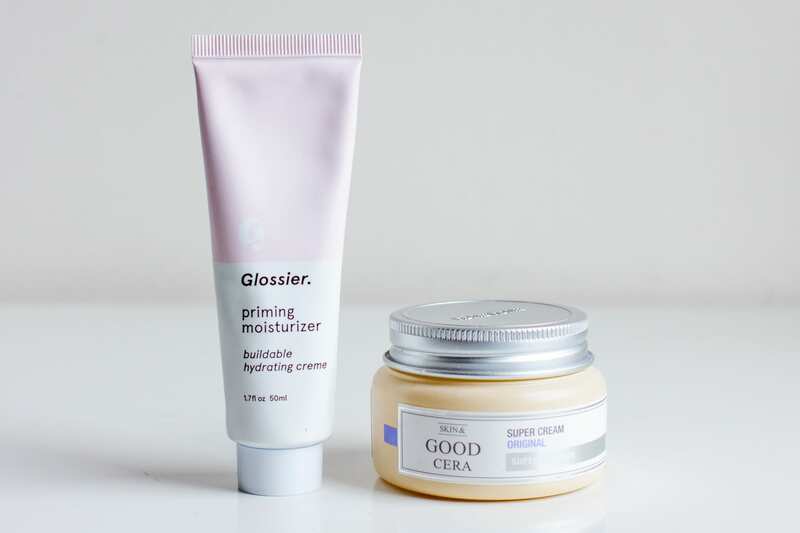 Talked a lot about this in my Glossier review~ It’s a nice, simple, basic moisturizer and I’m currently on my second tube. 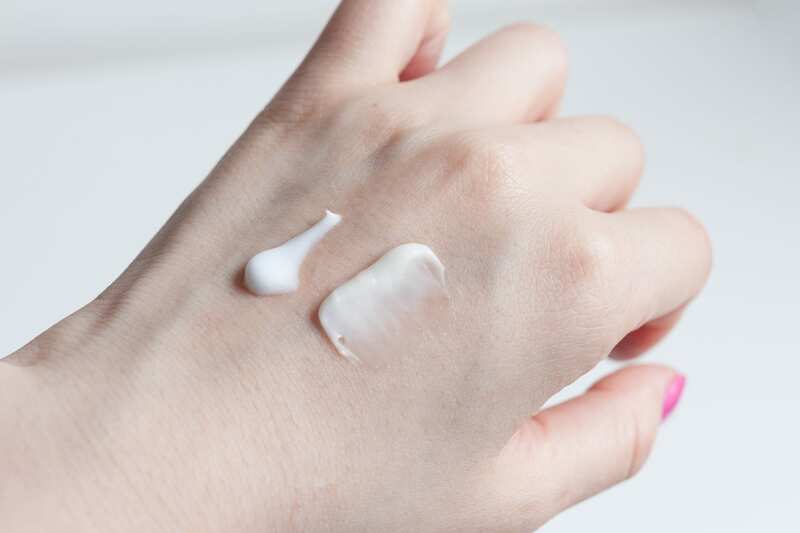 It’s not a life-changing product, but it’s a good spf-free moisturizer for the day. Anyone who’s a fan of the Dr. Jart+ Ceramidin Cream should check out this alternative from Holika Holika. 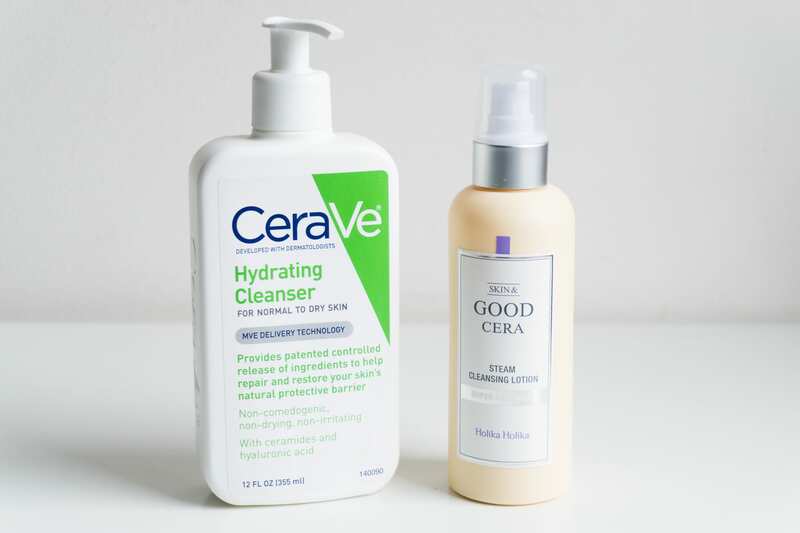 It’s has the same texture, scent, and usage properties as the Dr. Jart, but for a fraction of the price – I got mine for $20 and Holika Holika often does a BOGO on their Skin & Good Cera line! It’s a heavy lemon-scented cream moisturizer featuring ceramidin to lock in your skin’s moisture and I love slathering it on at night. I’ve got a few moisturizers to go through and spring is rapidly approaching, but I wouldn’t mind another jar for next winter. This came in a Memebox from a brand I wasn’t familiar with, but it surprised me with how moisturizing and unlike my preconceived notion of sunscreen. It does have a powdery fabric softener smell, but it’s not sticky and most importantly it doesn’t leave a white cast at all. The SPF is a little low so it’s only good for a quick grocery run, but I need some more Vitamin D and some color in my skin so it’s absolutely fine for me. I prefer using it during the colder seasons in lieu of moisturizer to prevent my foundation from pilling or slipping from too many products underneath it. I’ve wanted to try a “milk” type sunscreen for a while and Catherine sent me this because she didn’t have much success with it. Surprisingly, I really like it! 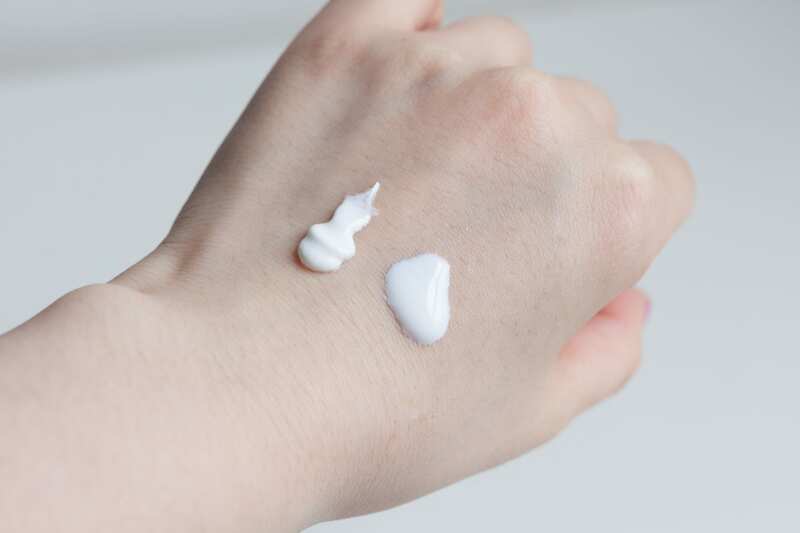 The “milk” type sunscreen is a chemical sunscreen so you have to shake it up before use, but I don’t mind the extra step for the ease of application. 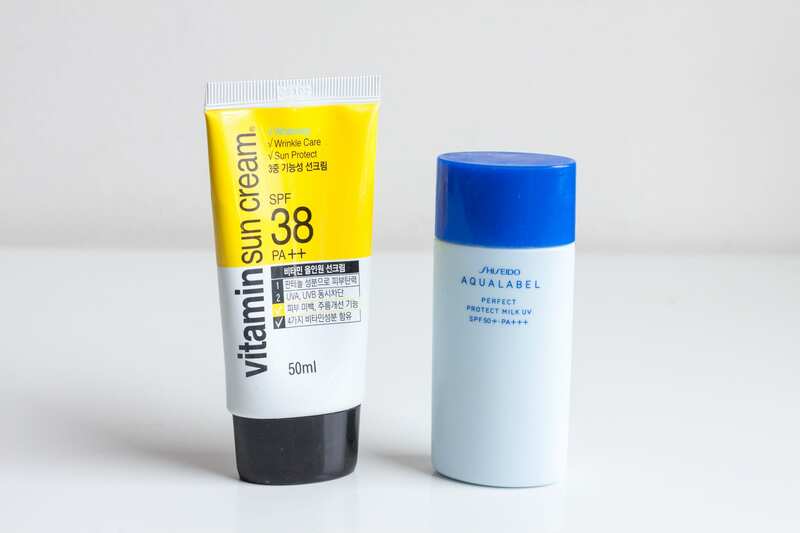 It’s a runnier sunscreen than the more traditional cream kind. The scent comes close to that typical sunscreen smell, but it has enough floral in it to just get away with it. It’s light enough to wear underneath my makeup and it dries to a smooth satin finish with no white cast and makeup application is a breeze. I can absolutely wear my regular moisturizer underneath it as well. I’ve had this for SO LONG and still haven’t finished using it. I talked a bit about it in the Memebox #3 unboxing post when I received it in 2014. 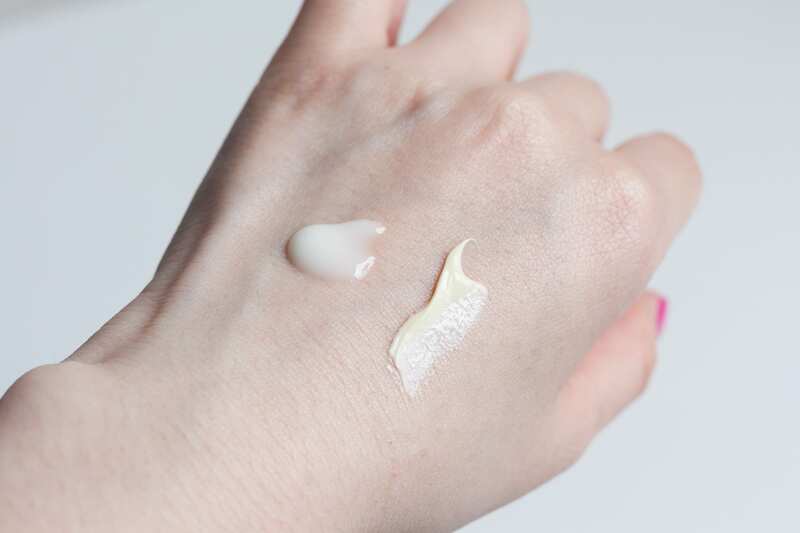 I like using it during the day when I plan on wearing makeup because it’s light enough to not result in any creasing under concealer, but it hasn’t had any of the promised effects nor is it moisturizing enough overall. And for the PRICE… fortunately I didn’t pay for it, but even if you can find it for cheaper don’t bother. 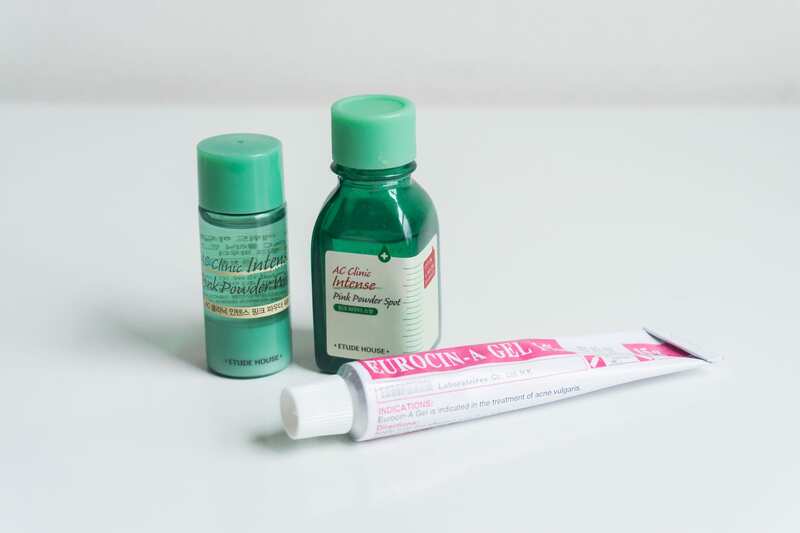 I’m sure I’ve talked about this before, but I bought this to fight an enormous monster zit  when I was in Hong Kong some years ago and it was the only that’s worked. I’ve asked for extra tubes of it every time a friend or relative travels to Asia. Originally reviewed in my Etude House brand collection post. My quickest way to get rid of a pimple is to cover it in the pink powder lotion and watch it dry out in the next few days. 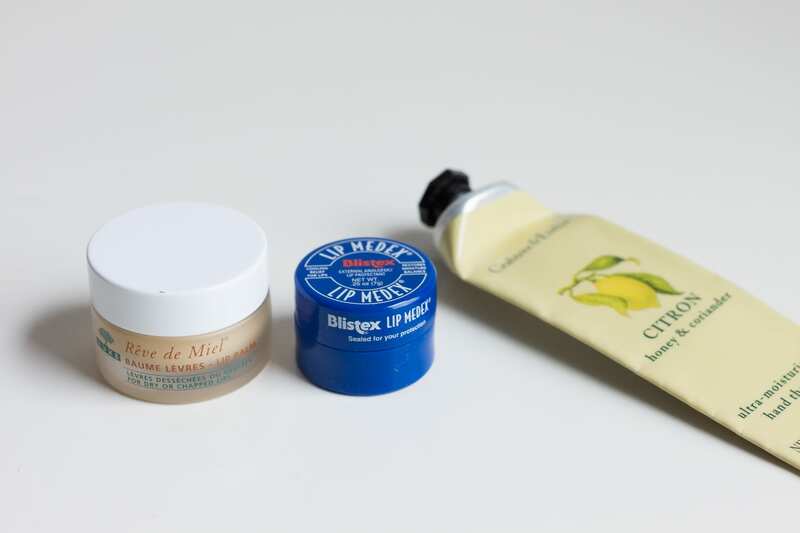 I was on a search for a thick heavy lip balm to wear at night and to help with my dry lips and I came across the Rêve de Miel balm through UK youtubers who raved about it. At $19 for .50 oz, it was pretty expensive for a lip balm, but I really like this. It’s a softened balm made with honey and grapefruit and I slather a ton of it on my lips at night before I sleep. I also use a thin layer of it it in the morning and it’s not greasy or glossy so I can wear lip products on top if it as well. It works great for my sensitive lips. I’ve used this for years and I have a tub of this in almost every bag I own. I have a bad habit of licking and therefore irritating my lips so I always make sure I have a lip medex on me in addition to whatever fancy lip balm I’m using. Last year I had an allergic reaction to a few lip pencils which resulted in sandpaper-y lips. No balm or exfoliant was working until I went out to buy a tub of this. The next morning the bumps had dried over and scrubbed right off. It’s a miracle worker!! My favorite hand cream brand & scent of all time! I love buying hand creams (and at one point I had 8 unopened tubes), but I always come back to this one for its fresh clean scent . It gets absorbed quickly and doesn’t leave a grease-y feeling like the ones from L’Occitane. Oh my god this is the best smelling scrub I’ve ever come across!!  It smells exactly like strawberry jam and I think I’ve always been a little bit disappointed that I can’t actually eat it! The scrub is a mix of Brazilian black sugar, strawberry seeds, and strawberry oil, the latter of which you can actually see when you open up the container. The sugar grains give it a nice scrub-ability while the oil keeps it from scratching or drying out your skin too much. I love it so much that I’ve already bought a backup. I talked about the Moon Mask in my Glossier review post and mentioned that I loved how simple it was. I use it whenever my skin feels dry & sensitive because I’m confident that it will hydrate my skin without causing any additional irritation. However in the winter time I think I need something much heavier and so while I’ve liked it all these months and think it’ll be great for the coming spring season, I may be in the market for something next winter. One of the best masks discoveries I’ve come across in the last year is the Jeju Hallabong Energy Pore Ghassoul Pack from The YEON whose store in Flushing is one of my most frequent beauty haunts. The Pore Ghassoul pack is a clay mask, but it smells & feels nothing like a traditional clay mask. There’s no charcoal or mud scent at all and instead it smells like fresh citrus – hallabong is a variety of the mandarin orange – and it doesn’t dry down to a cracked tight finish. The Yeon sells their masks in a trial kit and the pore mask never dried up in the 2 weeks it took for me to finish using it. I’m always recommending this to friends with dry skin who want a clearing mask. 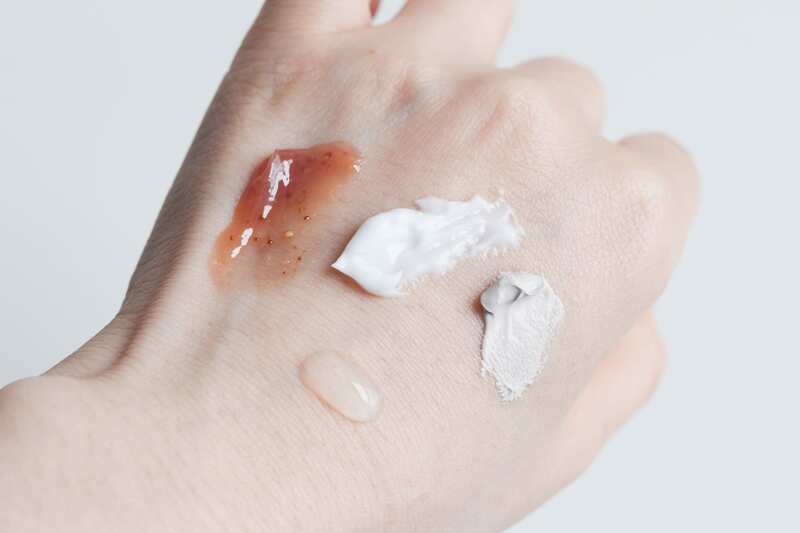 My newest mask purchase is an overnight Jelly Pack, the flagship product of J.ONE, a cosmetic brand founded by Korean actress Ha Jiwon, and voted a top item on Get It Beauty. I recently FOUND A WRINKLE between my eyebrows so when I saw this this promised firming and pore-smoothing, I threw it into a Memebox order immediately. I’ve only used it about 8 times so far and have only seen results 50/50 of the time so perhaps my review is premature, but I like how quickly it sinks into the skin without doesn’t leave my skin sticky throughout the night. The strangest thing about this is the texture. It’s a gel, but with oddly enough it has the consistency of the cornstarch mix that you might have played with in elementary school??? It’s takes some getting used to, but if you pat the product in instead of “massaging” it as directed, it’ll work much better. Anyway – interesting product enough for me to continue using and I’ll check in with a full review if it works some magic. I’ve had these for quite a while and still haven’t gotten around to finishing them! 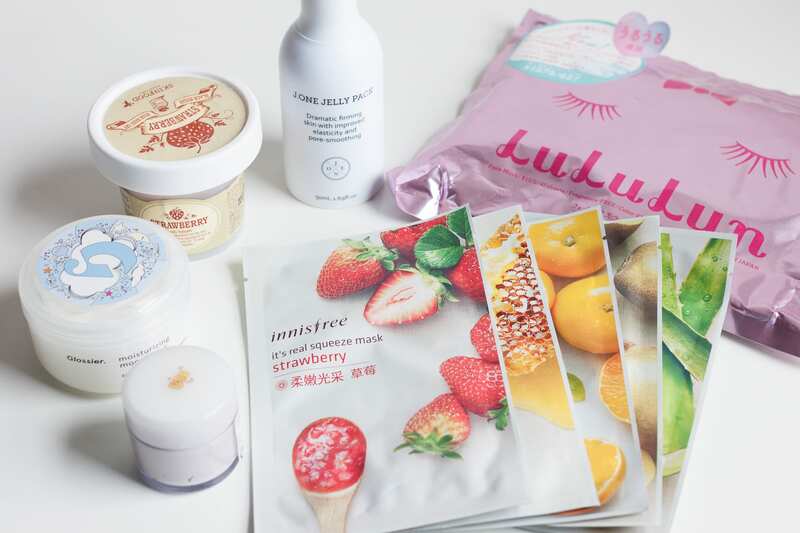 Lululun is a Japanese face mask brand and they’ve become very popular because of how extensive their product line is and how cute the illustrative packaging is. I picked up the Regular/Everyday type in the large quantity packaging. There are 42 sheets in each re-closeable package and the masks are fragrance-free and also free of any artificial dyes. Not sure how often I see colored masks (I know those cartoon/animal ones exist, but I feel like they are a niche in the scope of the face mask market), but it’s definitely nice to see something unscented. These are paper-thin, but as I understood it, this type was meant for everyday use and each sheet costs only about $0.50 in the long run so it’s not bad. Whenever I can spare the time, I’ll use one of them in the morning before makeup and it makes my skin look great! I’m always testing a different sheet mask in addition to the Lululun face masks and this month it was finishing up the Innisfree sheet masks I purchased when I was in Guangzhou. I go a little bit more in depth in the Innisfree brand collection post. Cotton pads are so expensive so I’ve been trying to make do with 5-layer cottons so I can get some more use out of them. I recently switched to a generic brand and I hated them so I might come back to these when I get through the others. I’m not 100% committed tbh! The NR ones hold up well to usage and don’t tear even when they’re split into the individual sheets. I did notice, however, that one of the 5 sheets is more loosely woven and thinner than the other 4 which isn’t cool. I don’t have the $$$ to invest in a fancy Clarisonic so I ended up picking up a pore brush in a Memebox haul a few months ago. The brush head is incredibly soft and it feels great on my skin, but the density of the bristles mean that it takes a while to dry and I’ve noticed that the brush is still damp in the center in the morning. I use the textured side for scrubbing my nose and pores and it feels so good, but I’ve spotted a few of the textured bits falling off the brush so again it’s a toss-up of quality vs price. I think for $9 is a fine brush as long as you can find time to dry it properly. SO CUTE!!!!! This was largely an impulse buy TBH but I reasoned it out as needing a backup headband while my Muji one was in the wash HAHAHA. It’s as cute as you think it would be & sooooo soft. The fit is a little bit tight for my big ol’ head, but these things stretch out over time so it’s better that the elastic is nice and strong. Beauty routine on the way! Great post, Susan :) I love this layout — so visually appealing and efficient. I really love the fact that you also showcase a wide selection of Chinese/Korean/Japanese skincare products. 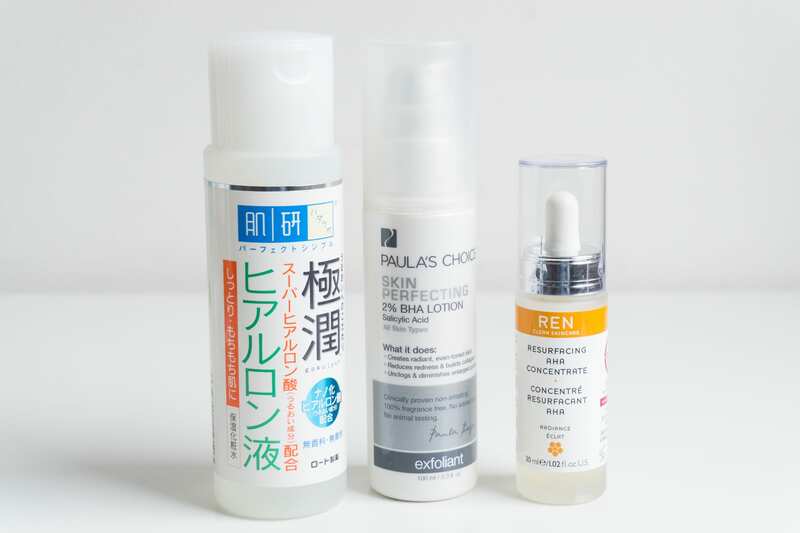 Looking forward to the next post about spring/summer products!